Summon your attendee #777 minion. Wasshoi, yes, yes. 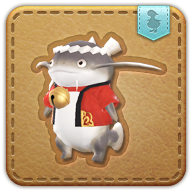 Gyoshin labored through several nights to fincraft this tiny Namazu (though the happi stitchwork is clearly Gyorei's). He intended to make it in the likeness of the 777th attendee, but soon lost count, so model selection was ultimately random. Increases DEF of all allies within range by 20.